Large 14k Yellow gold Latin design cross pendant. This cross measures 40mm in length by 23.5mm across. A very nice sized cross. The back is flat and textured. This cross is hollow. 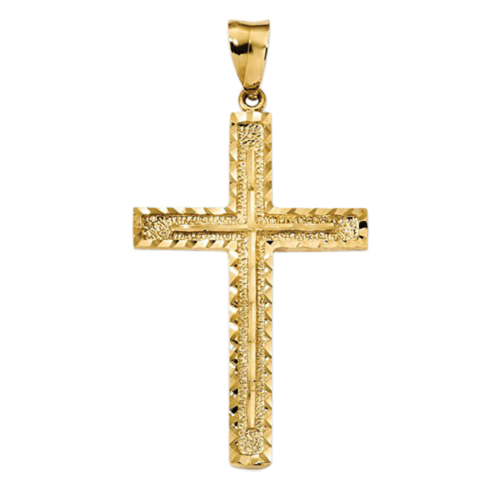 Large 14k Yellow gold hollow cross pendant. Cross measures 40mm in length by 21mm across. Simple polished design. 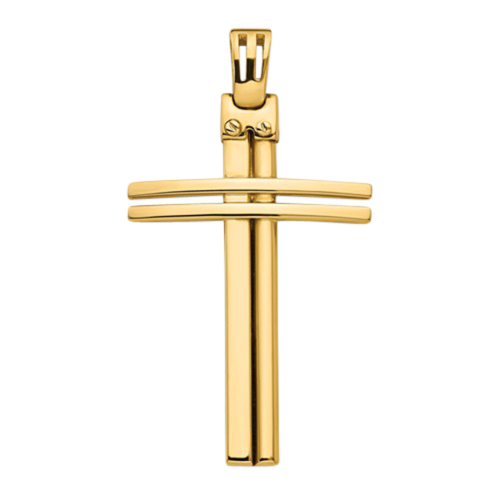 Luxurious 18k Yellow Gold Scapolare cross pendant. This Italian created cross measures 37mm in length by 27mm across. Cross weighs 10.5grams. 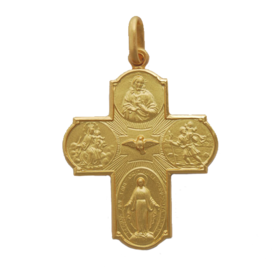 This four-way cross features The Sacred Heart, Joseph, Christopher, and the Miraculous Medal at the bottom with a center Dove. Beautiful buttery 18k Gold, what an amazing symbol of your faith and devotion. 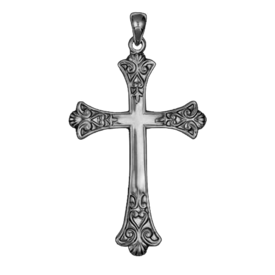 Beautiful Platinum Cross is a Large Solid cross. Measures 38mm x 26mm. Keep in mind 25mm = 1 inch. Cross weighs 5.52 grams. If a Bold Solid Platinum cross is what you are looking for, this would be an Excellent selection. Our platinum cross pendants are made with 950 platinum. 14k Gold Ankh cross pendant measures 45mm in length (including the bail) by 24mm across. This cross weighs 4.86 grams. 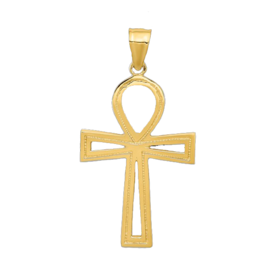 The Ankh cross or Egyptian cross was taken from the Egyptian hieroglyphics image meaning "life". 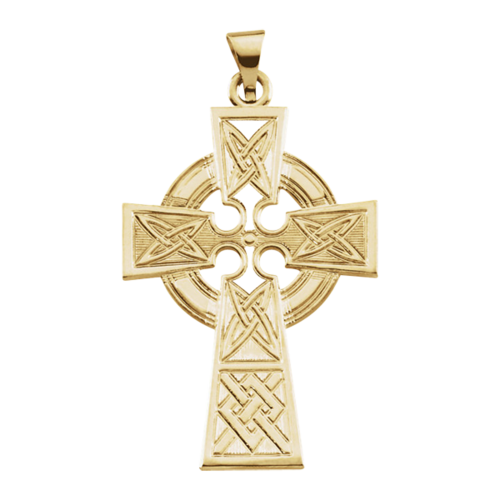 Saint Patrick Cross Pendant. Unique 14k two tone gold Saint Patrick Celtic cross. This beautiful design is large at 48mm by 24mm across. Celtic design is embossed on a satin finish background with the white gold eternal life circle symbol. Saint Patrick in white gold is the focal point of this incredible design. Features include a satin and polished finish with a textured back. Cross weighs about 3.91grams and is solid. 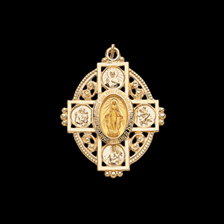 14k Gold Oval Miraculous Medal pendant. This pretty cross medal pendant measures 35mm in length by 28mm across. A beautiful symbolic Miraculous Cross pendant. 14k White & Yellow gold cross pendant. 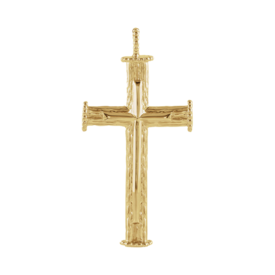 Amazing quality large cross is crafted in Italy and part of our "Guaranteed for Life" collection. Cross measures 33.2mm with the bail by 17.9mm across. Large bail is 8mm in length by 3.35mm wide. 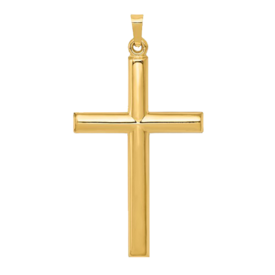 Large 14k Gold dual design polished cross pendant. Italian created cross measures 50mm (2 inches) in length by 28mm across and weighs 5.96grams. Beautiful simple design cross is part of our "Guaranteed for Life" collection. This cross is hollow. 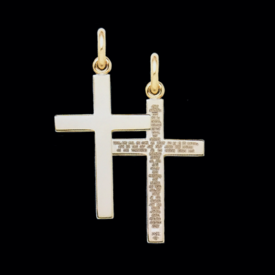 Large 14k Gold "Lord's Prayer" Cross pendant. 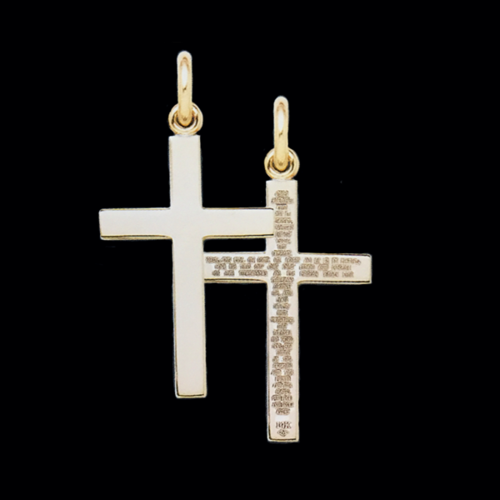 You'll love this plain design solid cross with the "Lord's Prayer" engraved on the back. This cross measures 50mm ( 2 inches ) in length by 25mm ( 1 inch ) across. 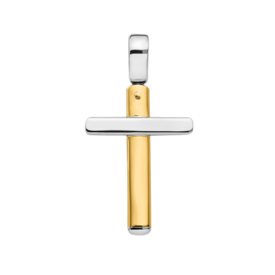 Front side of cross is a beautiful polished finish with featured prayer engraved on the back, wear either way. 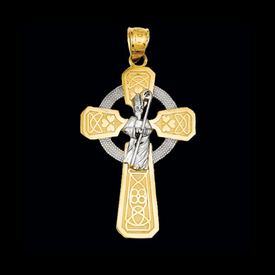 Distinctive 14k yellow gold Iona cross pendant. This cross measures 38mm in length by 26mm across before the bail. With the bail the cross is 48mm in length. The Iona cross was originated in Ireland and taken to the Island of Iona by St. Columba. The circle around the cross symbolized eternal life. 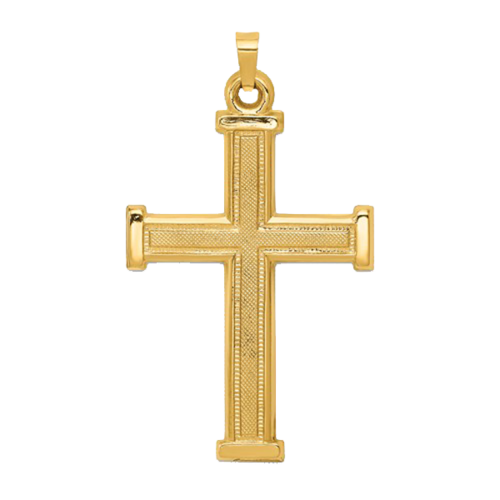 Stylish 14k yellow gold fancy cross pendant. This cross measures 34mm in length by 26mm across before the bail. With the bail the cross is 44mm in length. 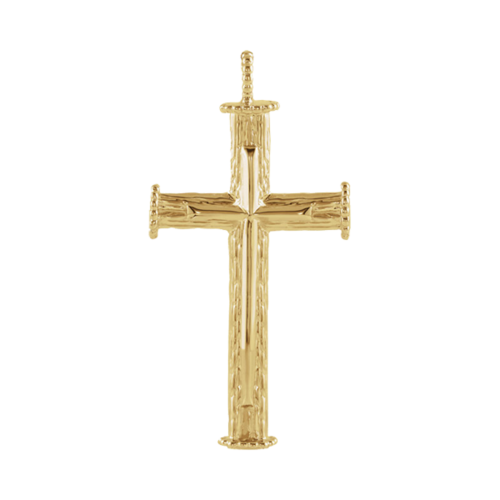 A solid gold cross with a polished finish. 14K Large Gold Cross. It's hard to see from the picture but this large bark looking cross has a slightly smaller polished cross sitting on it. 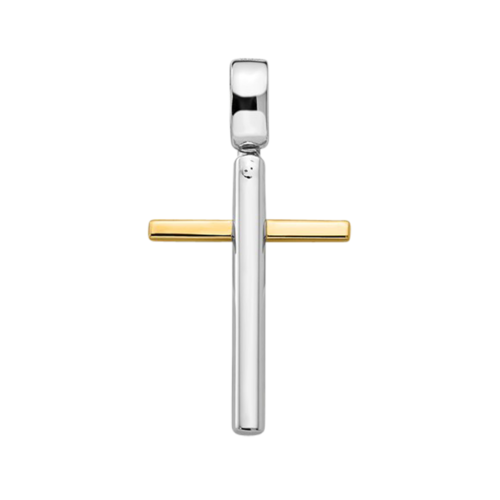 Cross is available in 14K Yellow or White Gold. Measures 39mm x 23mm. (25mm=1 inch) Special order this cross in 18k Yellow gold or Platinum, (longer time to ship in Platinum 7-10 business days). 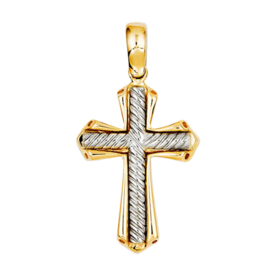 Pretty 14k gold polished and texture design diamond cut latin cross pendant. This cross measures about 1 1/2 inches in length before the bail. Cross weighs 3.35grams and is made in the Unites States. 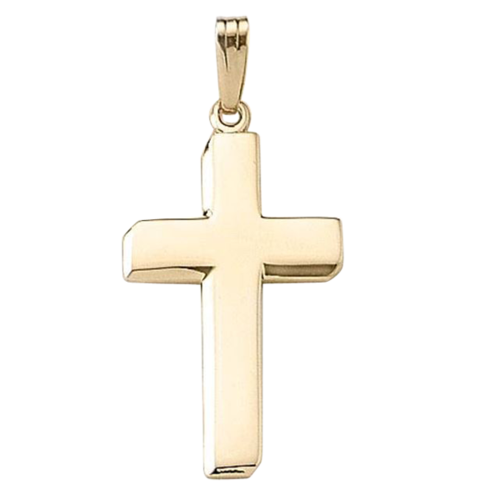 Stylish 14k Two Tone solid cross pendant. 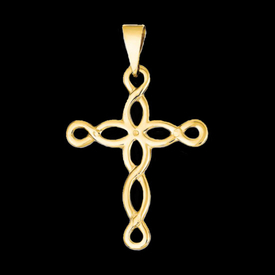 Unique design features a swirl design white gold cross set in a yellow gold encasement. This style measures 42mm in length by 21mm across and weighs about 6.28grams. 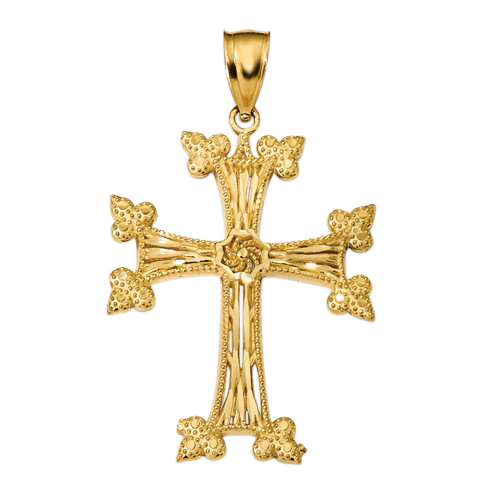 You'll love this large solid 14k gold cross. Back of this cross is flat. 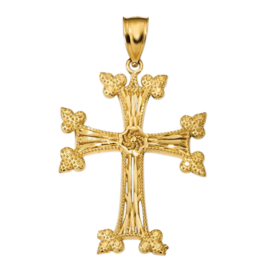 Unique design 14k yellow gold nature design cross pendant. This cross features a diamond cut open design. Measures 41.5mm in length by 25mm across. Large 14k Gold Celtic cross pendant. Cross measures 33mm in length by 23mm across and weighs 4.08 grams. Order in 14k Yellow or White Gold. 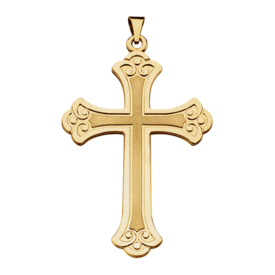 Wearing large cross pendants as a symbol of one's faith is an age old tradition. Throughout history, we see some noteworthy cross pendants that remain as special marks of time. The cross is one of the most recognizable symbols in the world. Throughout the ages, there have been various interpretations that include different historical and cultural significances. Among the popular ones are the Greek, Latin, Celtic, and the Jerusalem crosses, which are deeply embedded in the history of religion and faith. Most are simple designs, but still possess a striking religious meaning that goes beyond how they look. It's believed that this pendant originally belonged to Godfrey de Bouillon, a Frankish knight who led the Christians to victory when he captured Jerusalem in 1099. The style of this cross pendant is made with a large cross in the center together with affixed smaller crosses in the four corners. The four corners of the Jerusalem Cross serve as a statement that God’s dominion spreads throughout the four corners of the Earth. The "Warrior" was a famous large cross pendant that belonged to the Holy Roman Emperor Charlemagne. It’s been said that his was crafted from pure gold and had a sapphire set in it to protect pieces of the True Cross and the crown of thorns within. Celtic crosses date back to the period when most Celt population of Ireland was converted to Catholicism. The existing druid symbol on the cross with the circle in the center then became known as a religious icon in which the circle stood for God’s endless love. 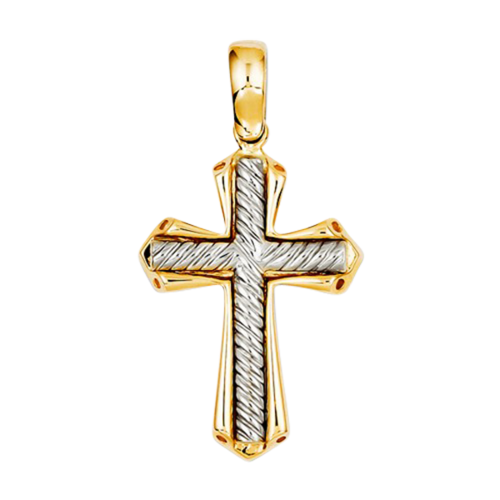 Gold cross pendants are exquisite pieces of jewelry, which are the most time honored. They come in a vast array of styles ranging from simple, unadorned metal to fully embellished ones with gems and diamonds. Aside from its religious origins, the gold material turns it to a lasting and timeless piece of religious symbolism. 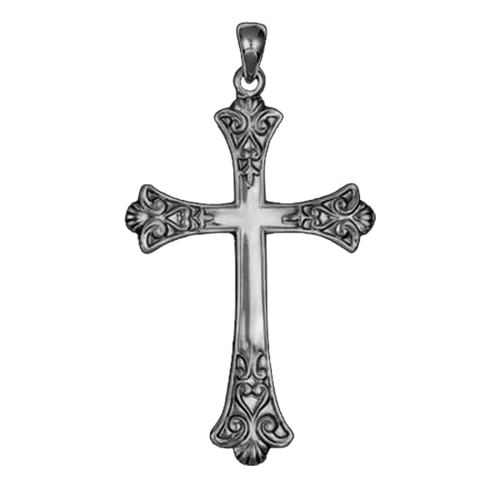 Sterling Silver cross pendants have become popular not only because of the beauty and intrinsic value, but also because of the the simpler design and lower cost. Modern cross pendants are made from hypoallergenic materials such as surgical and stainless steel, making it possible for people with allergies or sensitivities to be able to wear a cross pendant. As a keepsake for a new baby the cross comes to symbolize a new hope. By giving a cross pendant to a child, the thought and sentiment can be worn as the child grows. Cross pendants and rosaries are often the most treasured items in many households. This is not because of any monetary value, but because of their sentimental and religious value. 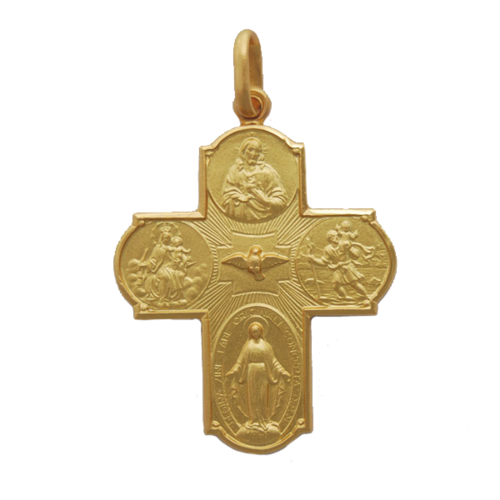 These treasures of cross pendants serve as personal symbols of faith and along with it, represents some form comfort to those who will inherit the jewelry in the future. Larger cross pendants feature eye-catching designs, which make them a popular choice among those who are looking for a unique way to express their faith. It’s perfect for those searching for a cross that reminds them of Jesus’ connection to every believer and witness. The huge cross can be worn as a necklace, or as a pin. Key rings, letter openers, and bookmarks adorned with a cross pendant are just some ways to pay homage to the land where the roots of our faith are buried. With over 3,500 exquisite designs to choose from, you can find the pendant to best suit you and your loved ones. Order one today!